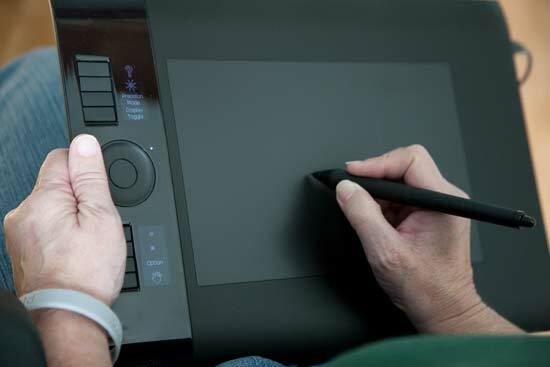 Wacom introduced the popular Intuos 4 line of tablets about one year ago. With a number of great enhancements, a very good graphics tablet became even better. Recently, Wacom added a new member to the family - a Bluetooth enabled wireless tablet that many people will find to be the perfect companion. This review is a combination of the previous Intuos 4 review for those that missed it, along with information on the new wireless model. The Intous 4 is available in several different sizes. With this version, Wacom has gone away from the physical dimensions to a size designation - small, medium, large, x-large. The sizes correspond to the previous tablets though, but should be a little easier to decide on which one to use. For graphic artists, and those that do a lot of painting, a large or x-large tablet is a good choice. For photography, I find that the medium tablet, with an active area of about 6”x9” is ideal Much larger than this and you start to spend too much time moving around on the tablet. For the Wireless, there is one size available. A bit smaller in active area at 8.0 x 5.0 (203.2 x 127 mm), the tablet has nearly the same dimensions as the Medium size Intuos 4. The extra space required by the Bluetooth receiver and battery account for the difference in size. In practice though, moving from the standard Medium tablet to the Wireless feels no different. For photography use, I think this is the ideal size - large enough to work with comfortably, but small enough to be practical in a variety of situations. The new Intuos 4 tablet is a more streamlined input device with some nice new features. The tablet is reversible to work well with right or left hands, and includes two USB ports to position the cable properly for each orientation. If you've used the Intuos 3, the first thing you'll notice is the Touch Strip and ExpressKey buttons on each side of the tablet that have been replaced by a single row of buttons and a Touch Ring. While this might seem like a drawback at first, especially for left handed users, Wacom has addressed this by making the tablet reversible. There are two USB ports on the tablet, one for right hand, the other for left hand orientation. The advantage to having all the controls on one side is the removal of accidental button or Touch Strip adjustments with the non-pen holding hand. To use the tablet for the opposite hand, simply turn it 180 degrees and set the control panel to left or right to match the orientation. The eight buttons have been pre-programmed with common functions - Help, Display Toggle (For users with multiple displays), Shift, Command/Control, Option/Alt, and the Hand tool (space bar). The Touch Ring scrolls windows in most applications, and in Photoshop defaults to zooming the display. At the center of the Touch Ring is a toggle button to change the wheel to one of the four available functions. All of the buttons have an OLED next to them that shows the currently selected function for that button. When the tablet is flipped over for the other hand, the text is rotated as well, so it's always in the correct orientation for the user. The ExpressKeys are now on one side of the tablet, surrounding the Touch Ring control. Each ExpressKey has an OLED display next to it to show the current function. When the tablet is rotated, the text in the OLED rotates as well. 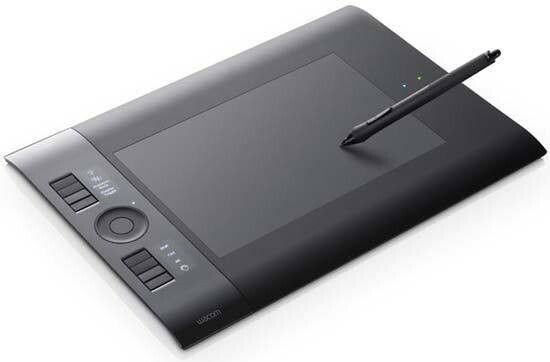 Along with the changes to the tablet controls, Wacom has doubled the sensitivity of the pen from 1024 levels to 2048. A brand new pen is supplied with the tabletThe new tip sensor requires only one gram of pressure to start working, making extremely fine points or lines possible. The end result is that the pen has a more natural feel. Wacom includes replacement tips, or nibs, for the pen in standard, felt, stroke, and flex responses for a wide range of uses. In a nice touch, the pen holder is now the container for the nibs, making them much less likely to be lost (which I have always been very good at doing). 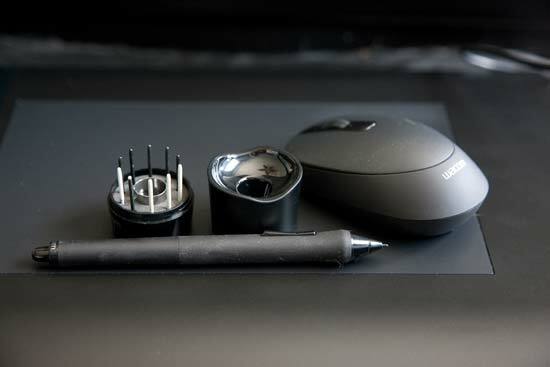 The pen stand does double duty to store the extra nibs that are included with the Intuos 4 tablet. This works much better than my old method of losing them within hours of opening the package. The mouse has also been enhanced to track both direction and orientation of the mouse. 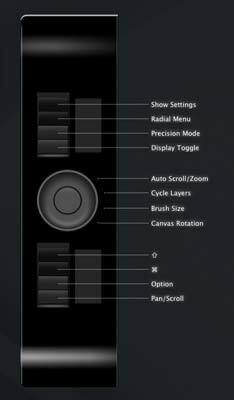 The five mouse buttons and the scroll wheel can be customized through the tablet control panel settings. On the Wireless model, the mouse is an optional component - I never use the mouse, so for me this is a non-issue, but if it's important to you, you'll want to keep this in mind. Setup is very straight forward. The supplied driver CD is installed, and when prompted, plug the tablet in. If you'll be using it in left hand orientation, you'll go ahead and set this option during installation (you can change it at any time in the control panel). Unlike previous versions, Wacom is not including the bundled software with the Intous 4. You'll need to go to the web site, and when the tablet is registered, you'll be given the option to download two of the three software choices - Adobe Photoshop Elements, Autodesk Sketchbook Express, or Corel Painter SketchPad. Also included with the tablet are Wacom Brushes, a collection of brushes for Photoshop, and a custom version of Nik Color Efex Pro 3. 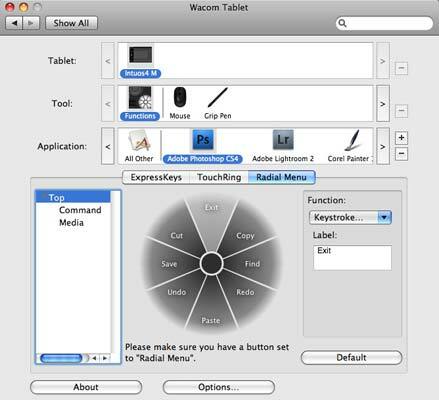 The Control Panel is familiar to anyone that has used a Wacom tablet in the past. There are various settings for the tablet, the pen, and the mouse that can be customized, either on a global level or at the application level Figure 4). 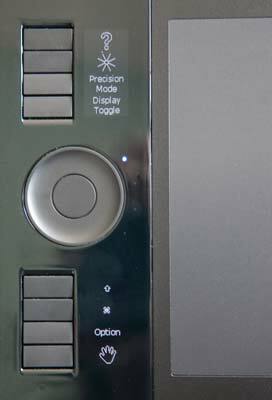 The Wacom Control Panel hasn’t changed much from previous versions. All recognized input devices, in this case a mouse and a pen, can be set to perform custom functions as well as adjusting the sensitivity. One of the more interesting new features on the Intuos 4 is the Radial Menu. Accessed by one of the ExpressKeys, this menu pops up a list of commands that can be selected (Figure 5 and Figure 6). Like other functions, the Radial Menu can be assigned application specific settings. 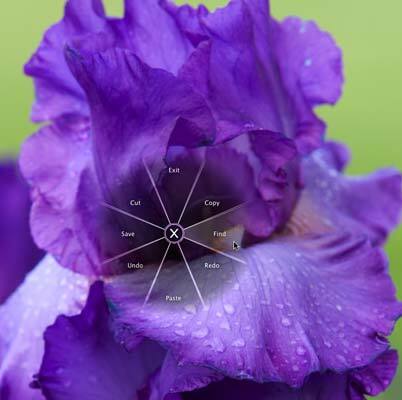 All functions for the Radial pop-up menu are set in the Control Panel application. You can have different settings for individual applications if you like. From the Radial pop-up menu that is accessed from the ExpressKeys, you can quickly select from a number of application or system wide commands. 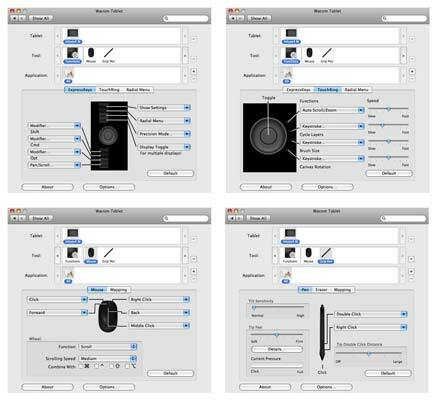 The commands listed here can be customized through the Intuos Control Panel. Having the OLEDs available at all times makes it much easier to work with different settings, especially for someone like me that works in a number of different applications and has a difficult time remembering what settings I've selected for any particular app. Along with the OLEDs, the on-screen help (Figure 7) is also a great feature. One button is pre-programmed for pop-up help on screen to let you quickly see what all the ExpressKeys and Touch Ring settings are for the current application. The new tablet also feels more comfortable in the hands thanks to a lighter weight and thinner profile. In use, the tablet is very much like the previous models, but with the greater sensitivity in the pen, it's easier to make very fine lines or selections. The tip also feels a bit more natural with less resistance than before. It now feels much like a pen on paper would feel.